Out of balance, the Corporate Social Strategist plans to integrate social media with the corporate website. Social Strategists have deployed social media in existing social networking channels like Facebook, Twitter, and beyond. Yet there’s an inbalance as they’ve joined customer where they are, but have not tied it back to their overall corporate website. This is due to a few reasons: primarily stemming from the reactionary nature of “we must have a Facebook strategy” and not thinking it through, and also the freedom to not rely on legacy IT and web publication systems. To restore balance, strategists will start to infuse the most trusted conversations of prospects and customers back to the corporate website closer to the point of purchase or during customer support. Expect that the first steps will be simple sharing tools, then aggregating discussions from branded communities to then Facebook features. Savvy strategists will know the risks and benefits of each of the 8 Stages of Corporate Website Integration and Social Media framework. Vendor set: Community platforms, Aggregators like Echo, and the existing integration protocols and embeds provided by the social networks themselves. Companies will focus on engaging in dialog with customers –yet expect most will do it wrong. 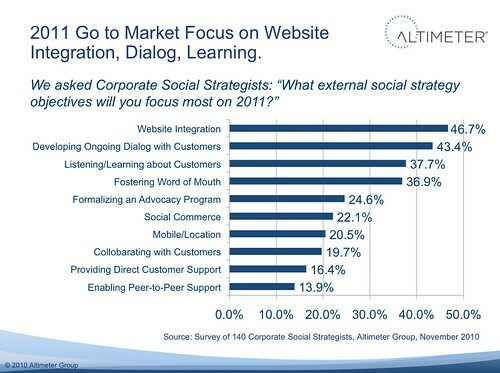 The second most important goal (43%) companies said they’ll focus on is developing an ongoing dialog with customers using social channels. Yet, our previous research focused directly on how they’ve attempted to do this on their own Facebook Pages shows that while they’re updating content at a rapid pace, they lack true dialog, engagement, and enabling the customer to leave their own voice. Our research found that when it comes to dialog brands scored a meager 3.1 out of a total 5 points, while they scored 5 out of 5 points in ‘being up to date’. While strategists may be focused on dialog with customers, most are unable to give up legacy behaviors of direct marketing, advertising, and spewing content in all channels. Brands must follow the 8 Success Criteria of Facebook page marketing –or risk an ineffective investment or worse yet, brand backlash. Vendor Set: Much of these skills will need to come from internal changes and training –until this is done, no third party vendor or application can help. While volume of customer voices increase, corporations bolster listening efforts –despite substandard tools The amount of content being created in social channels is increasing exponentially, this hockey stick growth from Twitter indicates that Tweets grew 1,400% last year to 35 million per day. To match, companies are already investing in brand monitoring systems, with deal sizes ranging from 50-100k per year per major product set. Yet, despite this investment, most of these tools lack maturity and do not return refined data sets, nor actionable information. Despite the technology challenge, the problem is getting worse for brands as the amount of content created by customers is increasing at a rapid pace. Vendor Set: Brand monitoring companies, while effective at counting number of mentions lack ability to accurate sentiment, provide actionable insights, or make suggestions on what to do. As outlined in the Social Business Stack for 2011, expect an emergence of the social analytics vendors to out place the commodity set of brand monitoring. In future blog posts, I’ll be discussing other aspects from our research, such as budgets, internal goals, staffing size, orginziational models over this coming next few weeks. Feel free to use this data in your slides and planning (this is Open Research), kindly just provide attribution to Altimeter Group. I look forward to your thoughts below, do you think companies will achieve these goals?